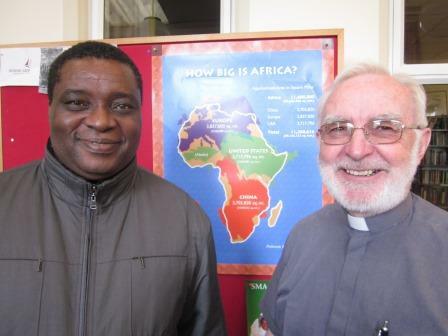 Fr Colum O'Shea pictured with Fr Basil Soyoye SMA, one of his earliest students in Ibadan. Fr Basil has also served as the Superior of his seminary alma mater. The SMA Provincial Council has released Ballinlough-born, Fr. Colum O’Shea SMA, for appointment by Bishop John Buckley as Assistant Priest in St Joseph’s SMA parish, Wilton. He replaces Fr Tom Kearney who was in the position, pro tem. After studies in Cloughballymore, Co Galway and the African Missions College, Dromantine, Newry, Fr. Colum was ordained in 1970. Assigned to the western Region of Nigeria, Fr Colum worked alongside other SMA priests and brothers in Ijebu-Ode diocese until his recall to Ireland to be part of the SMA Vocations team [1980-1986]. During this ministry he lived in the SMA House, Wilton. Returning to Nigeria in 1987, Fr Colum was a staff member in the SMA seminary in Ibadan, serving as its Superior for some years. In 1998 he was asked to take charge of the SMA Preparatory programme for seminarians in the north of Nigeria. Recalled to Ireland, he was appointed Superior of the SMA Motherhouse at Blackrock Road, Cork, a post he served in until October 2014 when he took a well-deserved Sabbatical break before his appointment as Assistant Priest in Wilton. During his years in Africa, as well as the positions detailed above, he was elected by his brother SMAs to leadership positions in the Society, a recognition of his administrative skills as well as his personal qualities as a pleasant, caring and wise counsellor. With his appointment, Wilton parish now has two Ballinlough priests to serve the people – Fr Michael O’Leary [Parish Priest] and Fr Colum. Fr Kearney will continue to assist in the parish for the time being.